University of Maine at Presque Isle student Cody Tompkins is taking time during his junior year to focus on one of his passions while at the same time helping his fellow classmates—by serving as a student Financial Peer Advisor. Tompkins, a Business major with a focus in Management and Leadership, has been tapped by the Student Financial Services Office to serve as the campus Financial Peer Advisor. In this role, his job is to help assist students who have questions about loans and money issues in general. 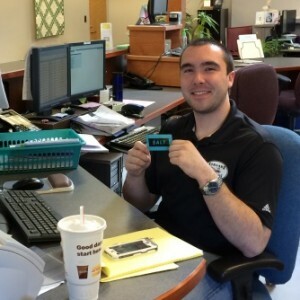 The Student Financial Services team felt it was important to add a student to their office to serve in this capacity. The idea for Tompkins’ position developed last April, when Boucher and Candace Roy, UCU Presque Isle Branch Manager, were at a statewide meeting for the SALT program. SALT was created by American Student Assistance, a nonprofit organization, to help college students and alumni become more financially savvy and provide them with skills to better manage their money and student loans. The program incentivizes students to make smart money decisions, and provides its services free of charge. UMPI was one of 7 college campuses in Maine to pilot the SALT program last year. At their SALT meeting, Boucher and Roy learned that the University of Maine at Farmington had hired a few students in their Financial Aid Office to help get information out about the SALT program and to meet with students around their campus. Boucher and Roy were very interested in trying to find a UMPI student to provide the same kind of peer services, especially for those students who hadn’t received basic money management skills before college. Tompkins is now available Monday through Friday at the Student Financial Services Office for appointments, and to answer student questions and emails. Tompkins’ hours are Monday from 10 a.m. to 1 p.m., Tuesday from 11 a.m. to 2 p.m., Wednesday from Noon to 2 p.m., Thursday from 11 a.m. to 2 p.m., and Friday from 11 a.m. to 3 p.m. He is also available at cody.tompkins@maine.edu. Boucher and the rest of the staff hope that, with Tompkins’ help, they can make students more aware of what they currently have taken out and spent for student loans, how they can reduce their money owed, and how they can avoid taking on significant loan debt. They also want to help get the word out about the SALT program, and to help students better understand the FAFSA process. To activate a SALT™ membership, go to www.saltmoney.org to sign up and receive benefits that will help in the next step after college graduation and beyond. For more information or get questions answered, call SALT’s Member Support team at 1.855.469.2724 or email them at salt@saltmoney.org. For help with college loans, call SALT’s Loan Counselling Support staff at 1.877.523.9473 or email them at loanhelp@saltmoney.org.